As we all know Sonam Kapoor is all set to surprize us with yet another cute role of her's in the upcoming movie 'Khoobsurat' starring her and Pakistani based Fawad afzal Khan, which is a remake of the 1980 movie with the same name starring Rekha. While how Snam will score in this movie is secondary, what caught my eye was the lovely outfits she is wearing for the film's promotions! I follow Sonam on instagram (sonamakapoor) and while browsing through my home page, this pic of hers popped on my screen and i instantly knew I had to blog about her! Love her look top to bottom! The choice of hair and accessories really compliments the dress. This was what she wore for her promotions at 'comedy nights with Kapil'. While I totally love the look (double drool ^_^), bottom down, it didn't work for me! Another instagram sneak peak! Love the way she styles the maxi dress. 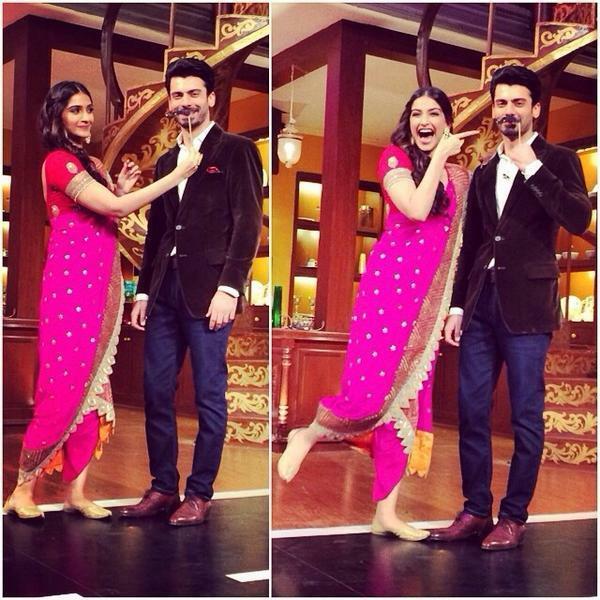 Sonam on The Sets of EKLKBK again promoting her movie along with Fawad Khan. Full shot below. Which of her outfits did you love the most? Do share! though i dont like her as actor bt her style is really good. lovely compilation sweety! Yup.. she is one fashionable girl in Bolly..
Look What I Bought ~ Fostello Elite Handbag!